The 22nd annual Haltech World Cup Finals - Import vs. Domestic event produced by Miller Brothers Productions (MBP) will take place at Maryland Int'l Raceway on November 1-5, 2017. The event draws hundreds of Heads-Up racers from over 10 different countries competing for over $100,000 in eight different classes of competition: Mickey Thompson Tires - Outlaw vs Extreme, ATI Performance Products - Radial vs Modified, Precision Turbo & Engine - X275 vs Hot Rod, JPC Racing - Street Fighter, Fuel Injector Clinic - Wild Street, Real Street Performance - Super Street, Driveshaft Shop - True Street, and Competition Clutch - All Motor. The International Bikini Team kicks off the Bikini Contest presented by Victory Precision Machine on Sunday and is always a crowd favorite at WCF! Also, be sure to check over 2,300' of vendors on the vendor midway where you'll find performance parts, accessories, and apparel at great prices! 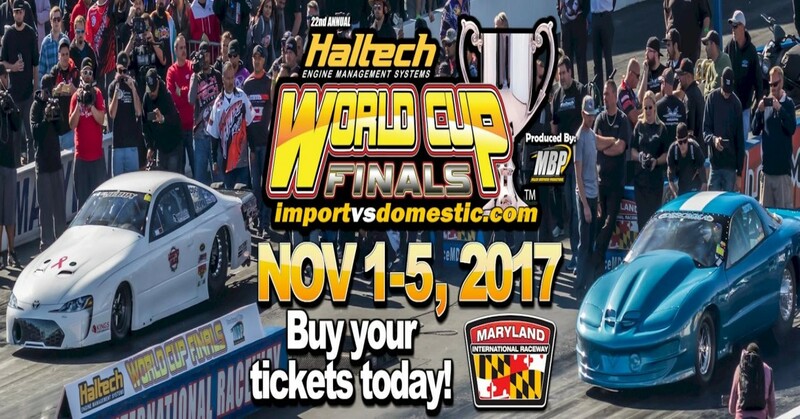 So be sure to mark your calendars for the 22nd annual Haltech World Cup Finals - Import vs. Domestic event at Maryland Int'l Raceway on November 1-5, 2017 for the best show in drag racing!